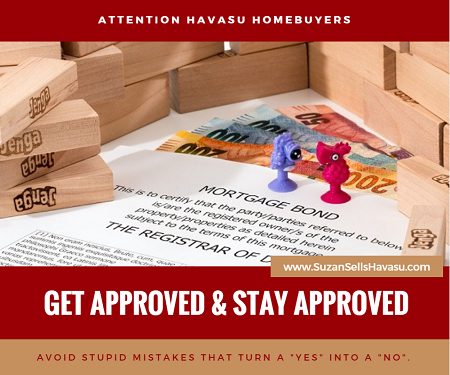 Being approved for a Havasu home loan is just the beginning. One of the trickier parts may be to stay approved. One false move could void out your loan approval. You've worked way too hard to lose out now. So, avoid these mistakes buyers sometimes make when purchasing a Havasu home. Now that you're approved for a loan, you're dreaming about how to decorate your new place. Your old furniture just won't due. And those appliances are going to need to be upgraded. Stop! 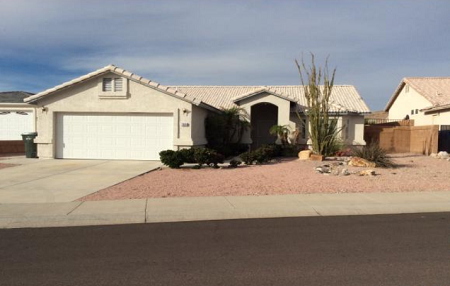 Wait until AFTER escrow closes and you've moved into your new Havasu home before you start making big purchases. These can affect your debt-to-income ratio. If you were already borderline on that, a big purchase could move you from "approved" to "unapproved". Repeat after me. "No new credit." You may need a new car. Or, you are buying Christmas presents and the sales associate offers you a discount if you open up a store card right then and there. Better yet, you want to transfer your balances onto a new zero interest card. I have one word for you: Don't! Every inquiry on your credit lowers your score. Plus, new accounts may temporarily lower your score as well. Then, when you add new debt onto old debt, you could be cruising for a bruising come mortgage time. Yes, this should be a "no-brainer". But, due dates can easily be lost among the hustle and bustle of our everyday lives. If a late payment shows up on your credit, it could lower your score. Even if you dispute a charge, make sure you continue to pay on time. You don't want that to be the reason you don't get your new Havasu home. 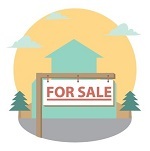 Another 'no-brainer" for Havasu homebuyers: stay employed. But, I still need to enforce this. That means don't get fired and don't change employers. This shows financial instability with lenders. On the other hand, if you get a promotion or a raise, that's always good. Finally, Havasu homebuyers need to leave their money alone. Don't move large sums of money from account to account. And, definitely, don't make large last minute deposits or withdrawals. This also makes lenders nervous. Once you're approved for a Havasu home, be smart. Sit tight. That house isn't yours until papers are signed and keys are exchanged. You could lose that home before you even move in if you make silly mistakes.